Wedding Season in Jacksonville Florida is in full swing. Elegant Limousines has the Limo you are looking for to make your wedding day perfect. Our fleet of limos in Jacksonville consists of white 10 passenger Lincoln Limos in Jacksonville, 20 passenger SUV Limos in Jacksonville and if you don't want to go with the traditional white Jacksonville Limousine Service. 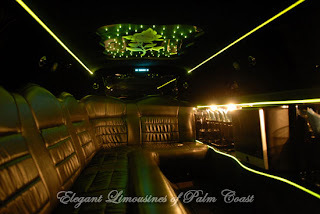 We now offer a very stylish black 8 passenger Limo in Jacksonville. Elegant Limousines wedding packages range from our silver 3 hour package to our platinum 6 hour package. You can add amenities such as red carpet service, fresh flowers in your Jacksonville Limousine and a chilled complimentary bottle of champagne for the new bride and groom to celebrate. All of these options are standard in our platinum package. They may be added to the other wedding limo packages in Jacksonville for a fee. 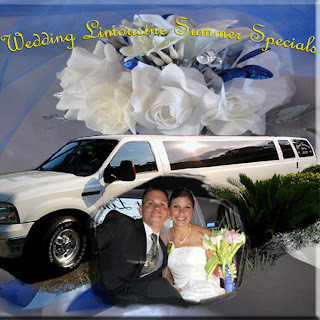 I would say that out of all of our Jacksonville Limo Wedding packages the 4 hour package is the most popular. Start your wedding day off with a nice relaxing ride in one of our beautiful Limousines to the ceremony. With our 4 hour package this gives plenty of time for the Limousine to bring the bride and brides maids to the ceremony first then return to pick up the groom and grooms men giving the ladies more time to get ready at the church. After the ceremony the newlyweds will be greeted by a red carpet to a Jacksonville limo decorated with just married signs and a chilled bottle of champagne for celebrating. Your Jacksonville wedding limos will then take the wedding party to there location for pictures and then off to the reception for a night of partying. You may also want to look into our Luxury sedan in Jacksonville, to take the new couple home safely after a night of celebrating. This way you will not have to pay for a Limo in Jacksonville to sit and wait all night. Your luxury sedan will arrive at the reception at a predetermined time. Now the bride and groom can still make a grand exit without breaking the bank. Here is a link to Elegant Limousine's website.